Phi Phi Island's azure sea, sand and mountains, along with the Phi Phi island Cabana's 162 rooms is ideal spot for your dream holiday. 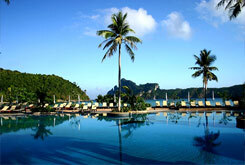 Phi Phi island is situated between Phuket and Krabi province. This paradise island can be reached within 90 minutes traveling by hotel-owned luxury cruiser called Sea Breeze from Phuket or Krabi. 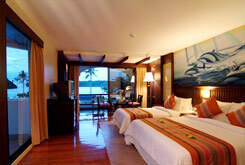 The Phi Phi Island Cabana Hotel is located on 18 acres of prime land, nestled between Ton Sai Bay and the Loh Dalum Bay. 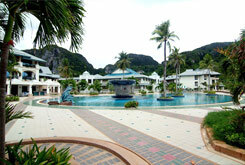 The low-rise resort is built to reflect the modern Thai architecture overlooking both bays. 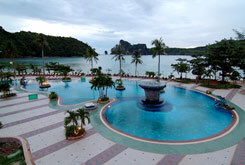 Its 162 rooms are spacious with panoramic view of the Andaman sea. 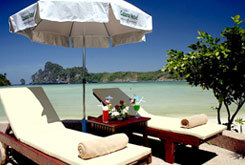 Phi Phi Island Cabana Hotel is the first and the only luxury hotel located on this prime sport. Soothe your senses with Thai traditional and aromatherapy massage from our well-trained therapists. Our sauna rooms are provided to give you both ultimate relaxation and privacy. Open 11.00 am till 2.00 am. 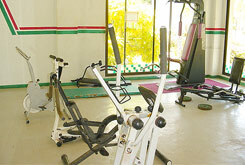 The Fitness Center are service with the fully-equipment and the experience staff with daily open from 09.00 am. 07.00 pm. The three VIP private snooker are serving with the standard table. The air-condition rooms are made you enjoy the game from 12.00 noon โ€“ 02.00 am. 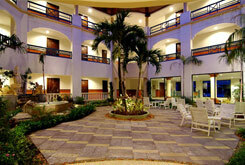 All the guest can enjoy their sports, such as the tennis, beach volleyballs and the basketball court. 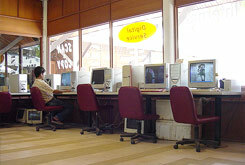 The fully equipment and good entertain from our staff should be provided with the warmest. Fine dinning and a spectacular view of Tonsai Bay, witch offer a range of seafood, tradition Thai foods, Asian and Western food, exquisitely prepared continental cuisine and a la carte selections are available for elegant evening meal from 05.00 PM. 12.00 PM. 6 contemporary buildings with 164 guest rooms are thoughtfully decorated in Modern Oriental style. Each features a perfect harmony of the Eastern charm and stylish Western. Come exploring the distinctive pleasure of your own. 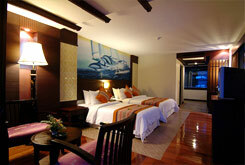 Each intimate room offers the breathtaking panoramic view of the Phi Phi Island and Andaman Sea. These pristine natures await you every time you visit. Supremely comfortable. The spacious room with functional design suits every unique lifestyle of yours. 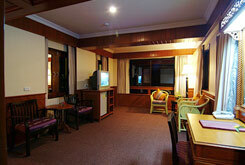 Guests room facilities and amenities ( A/C 154 Rooms , Double bed, Twin Beds and Triple beds ). Inspired by graceful Thai architecture in harmonious with stylish function, our suits are the elegant living space created especially for you. 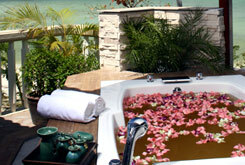 Immerse in the Jacuzzi, listen to the sound of nature and enjoy elegant romantic day. 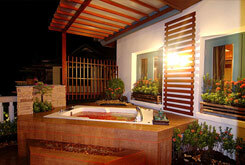 Junior Suite Category ( A/C 5 Rooms )1 Out Door Jacuzzis, 1 Living Room, 1 Bed Room. 1 Jacuzzi, 1 Living Room, 2 Bed Rooms.